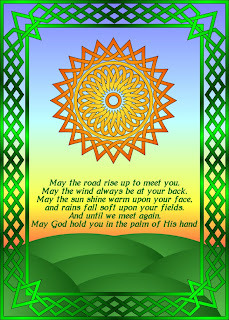 When I was young, my mom had a little stained glass knick knack with the old Irish blessing on it. I remember it, and how pretty the sun looked shining through it, but I don't recall exactly what it looked like other than it had a lot of orange and green and the blessing. I decided to turn the idea into greeting cards and coffee cups at Zazzle. I resized the art to make the printable poster above. (The original is 7x5 inches at 300ppi). After spending entirely too many hours drawing the frame part, I decided it would make a good coloring page as well. Usual terms apply. Use it for crafting, woodburning, coloring, embroidery. Just please don't offer the image itself for download. 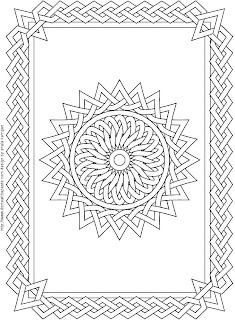 You can find a lot more braided designs on my coloring page. Click on images for full sized versions. Your coloring page is so pretty! Thanks for sharing it, I'll be linking. I love it, thanks so much for sharing!